A day in the vineyards can be as good as tourism gets. Trestled hills entice you to explore, roses nodding their approval at the end of wine rows as you pass by. Picking the right cellar doors to visit allows you to not only indulge in sampling wines to your taste but also converse with people who tended the grapes, filled the machines at harvest, and nurtured the wine through tanks and testings to the finished product. Happily, across the world wine and food appreciation go hand in hand, so on top of the oenological experience one can more often than not eat exceptionally well too. It's important that the two go together: it exercises your full taste palate, but, more than that, you also need that sustenance from top-quality produce to get yourself through the tiring business that is wine touring! The town of McLaren Vale offers a range of food outlets along its Main Street. Set back from the road, Market 190 would be easy to miss, or mistake for a household setting up for a party. As you cross the porch, however, a specials board confirms that this is more than a residence: pancakes with caramelised apple, maple syrup and ice-cream. It was a sign on the footpath, however, that had led us to investigate further: Barista of the Year. It's a title well-deserved: their coffee is superb. Light brown with a finger-width crema, perfectly roasted and extracted to give a drink bitter with caffeine, but sweet enough to need only a touch of sugar. A very happy start to the day. The pancakes themselves were excellent: fluffy and, as the picture shows, firm enough to hold their shape. The apple was a great flavour addition, but it would have been better peeled - with the flesh so soft after the cooking process the peel retained some sharp edges! 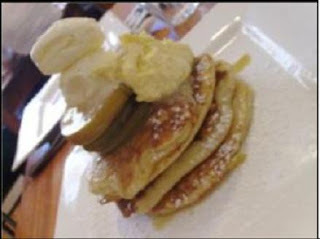 It was an amazing contrast with the pancakes we encountered in Glenelg. The conundrum of a vineyard trip is volume. Three vineyards is enough in a day if you don't want to exhaust your palate. 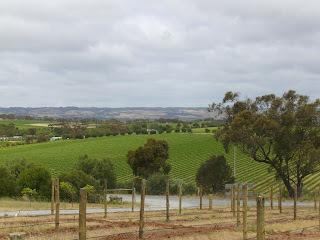 When one of those vineyards is d'Arenberg, you could retire, sated, to your B&B after visiting just one - they have around thirty wines on tasting, from entry level Stump Jump to the sumptuous Dead Arm shiraz. Exhibiting admirable restraint, we were able to visit Maxwell Wines (also pouring a fine range of mead); Coriole (who have planted the rare Roman Fiano grape; make a booking for their lunch platter); Fox Creek (try the Vixen - sparkling shiraz cab franc); and Pennys Hill (also the cellar door for Mr Riggs and Black Chook - tough place to visit last!). Lunch was at Settlement Wines, and was as happy an affair as breakfast. 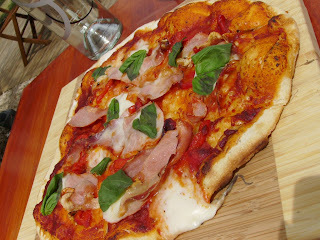 They offer four or five pizzas, with all the best of toppings, and sell their wines by the glass, starting at just $5. Our basil, proscuitto and bocconcini pizza was a perfect bracket to the day, enhanced no end by our outlook (above), and buoyed by a glass of Red Dingo, a semi-sweet red wine.